French GQ Style is the manual on how the modern man should dress with tricks and tips to answer every question regarding clothes, shoes and accessories. Buy a single copy or subscription to GQ Style French magazine. 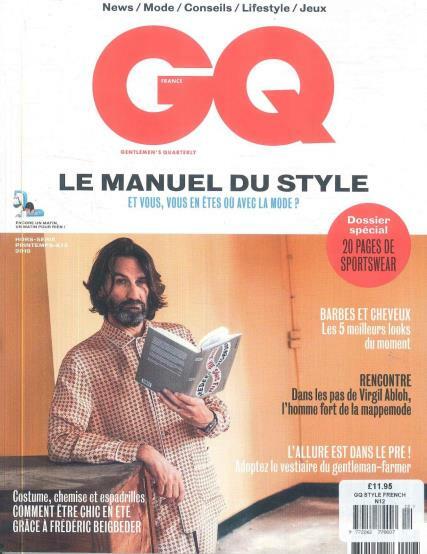 This is the French version of GQ Style which is known to give their male readers a mix of top trends, uniqueness and of course high fashion. If you are after adventure and intellect, then this is the magazine for you! Whether it is suits, shoes, shirts, watches and even denim, it’ll help to make the readers updated with the latest styles and trends. This magazine connects to its readers, as many of the men who read it are searching for advice and options that’ll cater with their special lifestyle. As if it were an art form on its own, GQ Style takes these top fashion designer products and presents them in a completely irresistible way, putting names like Louis Vuitton and Gucci into the mental repertoire of any aspiring gentleman.